Doing 10 halfs in 71 days didn't intimidate me as much as this idea of two races in one weekend. Who knew what would happen halfway throught the second race, muscle/hydration/glycogen wise. But, in for a penny, in for a kilo. I did a couple back to back runs this summer, but none at race pace, and that makes all the difference. After a 1:42 PB 2 weeks ago, I decided to aim for a 1:45 Saturday and a 1:50 (or whatever) on Sunday. For a civilized 9:30 start, I could sleep in til 6:45. Sweet. Left by 7:50, there by 8:45. Met the gang, and got my race kit with a cute technical T. It was great to have a fourth doing something wacky with Barbara, Dave and I- thanks Heather for sharing the fun. Slight rant alert. I'm sure the word is out that this race ran long, by 1 K. What made it more annoying was the speech at the start, how we were walking 100 meters up the rail trail to the start line because nobody like running that much too far, that would make it exactly 21.1 K. The K markers were bang on up to number 6, I mean right on. Things were looking good. Then one more K to the turnaround and water station (no marker). Next marker, 5 minutes later, said 7 K. By the 8 K marker I noticed that they were out by one, my Garmin said 9. I figured that they just screwed up the order and it would sort itself out. Nope. And, "perfectly flat"? The course only had one hill, but it was 11 K long. I went out pretty cautiously, slightly uphill I did 4 out of the first six splits at exactly 4:57. Walked through the water station, then turned around for the slight downhill. I ran with a couple of people for a while, it came up in the conversation about our 2 in 24/ 10 in 10. (a friend of theirs there was also doing both races that weekend.) Eventually I pulled ahead, I was feeling good. Past the start line and our cheering squad (thanks!) and on the the second turnaround. It was at this point that the truth about the distance mistake became obvious. Bummer. Heading back uphill 3 or so Ks to the finish was a tough slog. But it seemed worse for others, I passed 4 people in that stretch, 3 that could have been in my age group. And thats 4 out of 59 total racers, so a good percentage! Its been a while since I've been so glad to see a finish line; when you expect to run 21.1, that last k is unrelenting. 5 very long minutes; came across the line at 1:49:03, for a real pace of 4:56, or an equivalent time for 21.1 K of 1:44:07. I felt worse for Heather, to miss a PB because of someone else's bonehead error, or to have an asterix beside it, not fair. We know you did it, be proud. 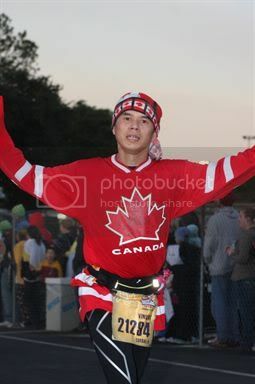 I was happy becuse I had ran my goal pace, for an extra distance. We all got age group medals, I was second for a silver. Pretty good day overall. Then I went home and had one hour to shower change and, nope thats it, on my way to Toronto. I hate paying for parking, the meet and greet dinner was phenomenal, maniacs are such an amazing group. Another hour drive home. 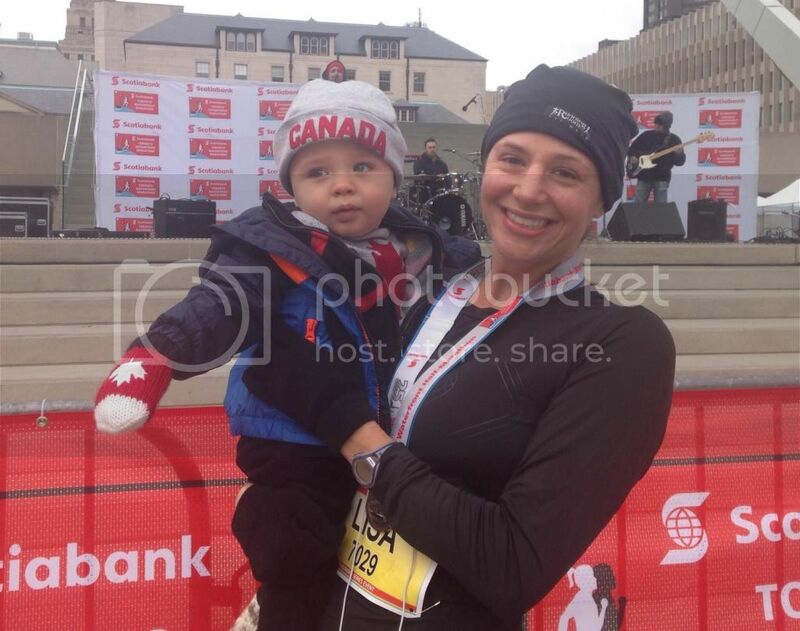 Sunday, Toronto Scotiabank Waterfront Half Marathon. I got up at 4:15, and left home at 5:15. I was sort of dreading this, but it was no big deal. Paid for parking again, and was in the corrals before 6:30. Didn't see anybody around at first, I may have been a bit early. Ended up corralled in with Ed Fizz, ChrisL, Jacc, Ray etc. Its great to have Maniacs around, really. Started out with that crowd, before long Ray and Mr Suave edged ahead, and I was playing leapfrog with Chrisl. I seemed to heat up way too fast, feeverish almost, by like 2K in. It concerned me enough that I eased up my pace. Also, I had to releive myself early because I lined up too soon. Of course my Garmin went nuts under the Gardiner,(it had me popping over to the islands a couple times) so I was doing the math in my head. My stated goal was sub-1:50, so I was firguring on how much over 5 minute ks I could be. By 7 K I had used up 3 1/2 of my 5 minutes of slack, if you follow me. 5:30 pace at this point! Out in the open, the wind was pleasantly cooling, even though I was sweating buckets. I made sure that I walked through the water stations and downed as much gatorade as I could, so as not to dehydrate. It was my main concern, not to cramp up. I picked up the pace at this point, and my Garmin as happy again, showing splits right around 5:00. 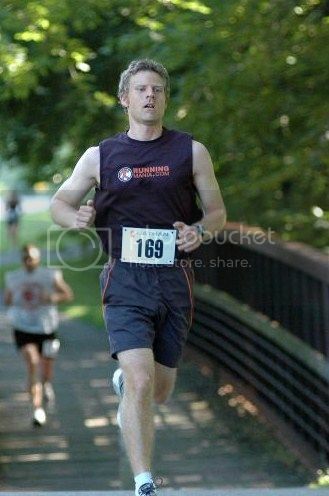 I hit my stride and started passing people. It did help to know the course, it was my first half last year. At the turnaround, there was a cheering squad (as so many places, thanks so much EVERYBODY!) 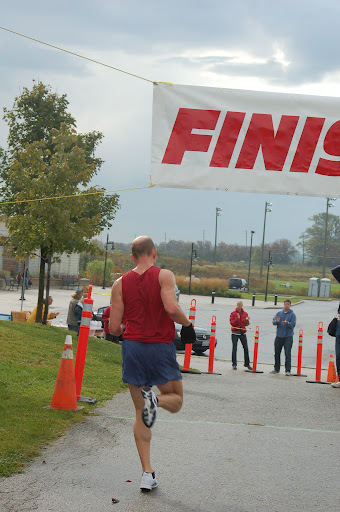 Once I felt better, I really enjoyed this race, and I hadn't expected to. I didn't have a very good time last year. Seeing the lead pack, and the other Maniacs, it was something. It was an event. 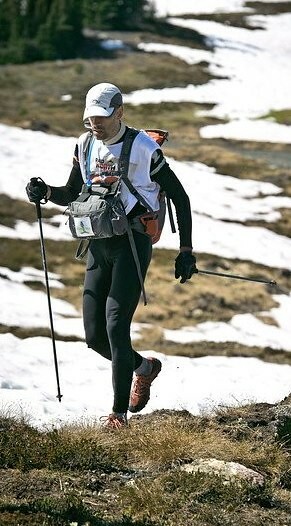 Coming back, with the wind, my pace picked up to around 4:50s but I lost time by being careful and slow at the aid stations. Main goal: to finish happy and healthy! 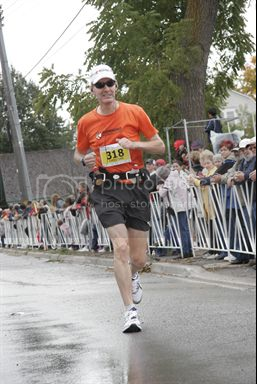 Being shorter than Saturday's race, I had a bit of a kick at the finish. Final chip time: 1:49:18. Alright! Not a PB, but a successful weekend stunt, and a heck of a lot of fun. For a stunt, it went pretty well. I did what I set out to do, and I think I was realistic in my goals: I wouldn't have wanted to have worked much harder. Today, I am slightly more sore than after most current halfs, but not as bad as my first, or doing a new distance. (Like ATB, that was tough.) I was concerned about my health, sickness-wise, but I pulled it off so I couldn't have been that bad. I did wake up in a sweat Saturday night. Sunday after the race, I hung around for a while, but didn't stick around for the Lonestar. I went home, showered, napped a bit, and then got dragged by my S.O. for an hour hike on the Bruce Trail. The dog's gotta play, and it was probably the best thing for me. good work for 3 and 4 in your 10 in 11 quest! Number of Maniacs Met: 225! oh man, a hike after all that running! Wow Sheldon, you sure ran a smart race, both days but especially Sunday. Congrats on an impressive back to back weekend!! Still so speedy despite the challenges you felt out there! You'll give me the 2 in 24 hours part, though, won't you Ironpickycomplainer? Way to go Sheldon! The scary part is over, eh? Nice work. See you at the Toad! The road to hell is paved. Run trails. Hats off to you! I'm still trying to figure out how you are handling this physically. Nice work Super Doonst!! I didn't get to see you, you are likely one of the only ones I didn't see. Cool stunt man, rest up and hammer the rest of those races. I had a great time meeting you again. Some people keep calling me Sheldon! I wondeer why? "Ok, j'vais l'faire le maudit Ironman!" North of Hélène, Dec 15, 2008. Sorry I missed you Sheldon!!! Great races. I can't imagine running so quickly on two successive days. ( Especially since you are " of a certain age" or close to it. ) The youngsters in your little clique have a job to keep up with you!!! you did all that - then went for an hour hike???? Don't give up before the miracle. Awesome report on the double Sheldon! I'm loving this fall tour! I run distance because I want to be in good shape when I die. Friends don't let friends do anything stupid. Great work, Sheldon! You are inspiring! See you at the Toad! Congratulations, You Maniac, You ... or, should I add, you Crazy Maniac, You .. I'm doing 2 25 K races to average it out. I will admit, our rules are pretty flexible. Barbara pointed out that we found one of the missing kilometers, on Saturday. Trixiee: today I am 99% back to normal. Slight hip pain, thats new but its fading. Plan to run tomorrow. Tortoise: This is my 50th September, I'm getting there! Nick: I find that backing off even 2 or 3 percent makes a noticable difference. Pretty remarkable to do two races in 24 hours, both faster than what your PB was just 1 year ago. Until you just mentioned it, I forgot the extra challenge you had of a considerably longer drive in on Sunday morning than Barbara, Heather and me. It's really weird to realize we won't Fall Tour together again for 5 weeks. Make that 4 weeks, I've changed my mind again. Check the SIG. Wanna carpool? Doonst wrote: Make that 4 weeks, I've changed my mind again. Check the SIG. Wanna carpool? Sweet! We can pick you up on the way. I am counting on that for Detroit!!! Great job Sheldon on the B2BR. Awesome. Wow, what a story! You not only ran two races back to back, but you did both pretty darn fast. I would've been PO'd too about Saturday's distance mix-up. Enjoy your recovery- it's back to the grind this weekend!